Promoting an active and healthy lifestyle can be a difficult message to convey to young children. Studies have shown that jumping on a trampoline is a very beneficial exercise and it can improve a child’s immune system, endurance and overall health. This is a fun activity that will help assist in your child’s health. If you are looking for a safe kid trampoline for toddlers or small children, this group of products will be your best choice. Below we will review the best trampolines for kids that are available today. These trampolines are specifically designed for younger children and toddlers. They are smaller than a standard trampoline and most feature additional padding and safety elements to ensure your child stays safe. Note that most of these trampolines have a fairly low weight limit roughly 100 pounds, so if you have larger kids, please look at our reviews for standard trampolines. All of the products listed below meet our safety and quality standards, and we would not promote products that we would not purchase and use ourselves. The Bounce Pro 7’ My First Indoor/Outdoor Entry Level Trampoline for Children is one of the best trampolines for kids. The Bounce Pro will hold up through the normal wear and tear of seasonal outdoor use and has been tested under normal outdoor conditions. They recommend only having one bouncer on the trampoline at a time with adult supervision to minimize the risk of injury. The metal frame and bars are covered by padding to additionally help reduce the risk of injury. The seven foot hexagonal jumping surface can support jumpers up to 100 pounds. We have seen many reports of two or three smaller children being able to jump on this trampoline with plenty of room to spare, but this can increase the chance of a collision and is not recommended. The trampoline comes in a 33”x33”x33” box and will take some effort to assemble. Dimensions: 60 In. x 60 In. x 62 In. First up is the Skywalker 60” Round Seaside Adventure Bouncer with Enclosure. If you are looking for safety features, this trampoline is not cutting corners. 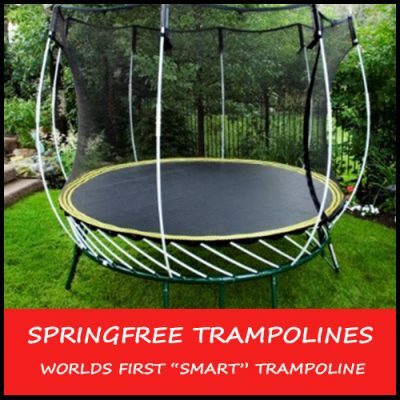 This trampoline uses elastic bands instead of springs, this will eliminate the risk of getting fingers pinched in the springs. There are two enclosures: one for the top half and one that is a floor skirt to keep kids and animals from getting underneath the trampoline. The top enclosure is a gapless 360 degree enclosure that fastens to the jumping mat. Kids can enter and exit through a small zipper access flap. There is also a padded support bar that wraps around the enclosure to provide a stabilizing mechanism for younger kids and toddlers. An additional pad covers the frame of the trampoline, leaving little to no exposed metal in the jumping area. This trampoline can support jumpers up to 100 pounds and is recommended for kids between the ages of three and seven years old. Up next we have the 48” Skywalker Trampoline, which is great for younger kids and toddlers. It is similar to the 60” version in terms of design and features; this is just a smaller model. This trampoline features a full 360 degree safety net and support bar enclosure. The support bar is great for kids who need a little assistance when jumping or standing on the trampoline’s jumping surface. There are no springs used on this trampoline just elastic bands to avoid getting fingers pinched in springs. A lower safety net will prevent toys and animals from going under the trampoline. There is a small zipper on the side of the enclosure net to allow toddlers to enter and exit the jumping area. There have been some reports of the instructions being hard to follow and the netting has been reported to rip around the zippers. With a little TLC, your kids will enjoy this trampoline for years to come until they are ready for a full-size trampoline. This next kid’s trampoline is great for both indoor and outdoor use—the Merax 7 Foot Kids Trampoline. The Merax 7 Foot Trampoline’s frame is constructed of high-quality steel and the legs are covered with blow-molded plastic for extra safety. There is a zipper to secure the entrance and keep kids inside the enclosure while they are jumping. With a seven foot jumping area there is plenty of room for your children to jump and have fun. The Merax has a warranty on weight limit of 100 pounds and is recommended for only one jumper at a time. But, according to the manufacturer, the trampoline can actually support up to 220 pounds. The shipping weight is 80 pounds. The jumping mat is supported by 36 galvanized springs to add plenty of spring to the heavy duty PP mesh material jumping mat. All of the frame tubing and springs are covered with padding for extra safety for your children. The Giantex Exercise 55” Round Kids Youth Jumping Trampoline is great for young children and toddlers. 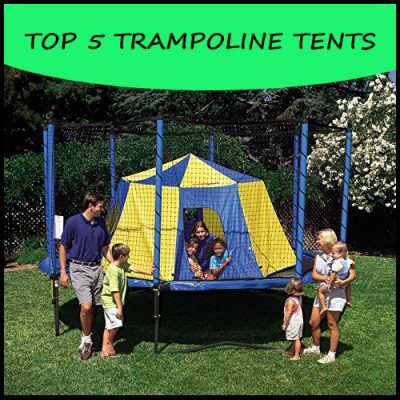 There is a four foot jumping surface that is surrounded with a safety net to keep the kids safe while jumping. Please note this trampoline is not designed for large children and only has a 66 pound weight limit. If you are looking for a trampoline for big kids check out our other recommendations. The Giantex 55” can be used both indoors and outdoors, but we recommend keeping the trampoline inside to get the longest life out of your purchase. If you are going to use the trampoline on hard floors, you may want to get a rubber floor mat to keep the trampoline from sliding around on the floor. If you have toddlers or young kids, the Giantex is an affordable trampoline that will not disappoint. The Little Tikes 7’ Trampoline is a great choice if you are looking for a decent sized trampoline for young kids to keep in an outdoor setting. Manufactured by Little Tikes, you know the quality and durability are going to be top notch, as well as their customer support and warranty. The frame is constructed of steel tubing and the bottom is covered with high quality blow-molded plastic for protection. The rest of the frame is covered with foam padding to reduce the risk of injury. There is a 100 pound weight limit to consider, and only one jumper should be on the trampoline at any given time to keep the product in good working order and reduce the chances of injury. There is a shoe holder included, which is a nice feature to keep the shoes organized and off the ground while the kids are jumping. The frame is covered under a one year manufacture warranty and the rest of the trampoline is covered by a 90 day warranty. The Little Tikes 7’ Trampoline is a great choice for kids three to ten years old, and is only intended for outdoor use. 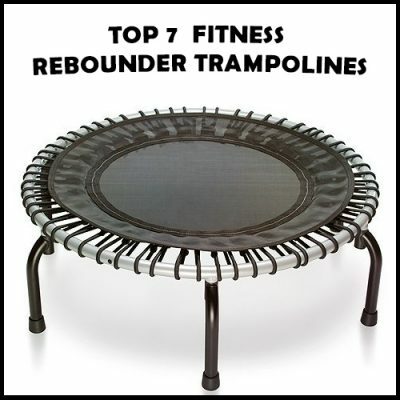 Next we will review the SkyBound Super 7 the Perfect Kid’s Indoor/Outdoor Trampoline. This is a great option for kids between the ages of three to seven years old; the manufacture says ten, but most ten year olds will be too large to safely jump on this trampoline. The jumping mat and pad are built into the same piece to add additional protection and leaves no gap for the kids to get their feet stuck in. The frame is made of heavy duty galvanized octagonal steel and is backed by a three year warranty. The safety enclosure features a reinforced dual zipper design that provides exceptional security while the kids are jumping around. The bottom legs of the SkyBound Super 7 are covered with brightly colored plastic to protect both the frame and your floors if used indoors. The enclosure is supported by an arch system to improve stability by dispersing the weight to multiple legs simultaneously. SkyBound makes some of the best quality trampolines on the market, and this trampoline gets great reviews and is highly recommended. The Kangaroo’s 36” Kids Trampoline is basically a rebounder for kids, and is a great way to provide fun and quality exercise to your kids. The manufacture states a recommend age of three years old, but it may be better suited for who are five years or older. These mini trampolines can be used both indoors and out and can support up to 150 pounds, which is great, as the trampoline will be able to support the kids as they grow. There is a handle bar support to provide extra stability for younger kids, which can be removed if it is no longer needed. Another great safety feature is the use of elastic bands in place of traditional springs. This prevents injury from getting pinched by the springs. The price is a little higher than some of the other trampolines that are this size; however, the Kangaroo hoppers are built well and uses elastic bands, making it well worth the money. Another great product from Little Tikes is their 3’ trampoline. These small trampolines are great for little kids that have endless supplies of energy to burn. This trampoline keeps the kids not only entertained, but also in good physical health from the exercise. It is recommended for kids between 36 months and six years old, and can support jumpers up to 55 pounds. The trampoline comes mostly preassembled and the handle bar folds for easy storage. The Little Tikes 3’ Trampoline can be used both indoors and outdoors. Great for young bouncers the jumping surface is 26.25” and is recommended for only one jumper at a time. Some individuals have stated the padding on the handlebar is a bit cheap and may need to be replaced, but other than that this is a quality trampoline that will provide hours of fun to any kid. Here we have the smallest full enclosure trampoline that Skywalker makes: the 40” Round Lily Pad Adventure Bouncer with Enclosure. The enclosure has a gap-free design that attaches directly to the jumping surface to eliminate gaps. The zipper that secures the entrance is reinforced to provide a safe bouncing experience for the kids. The frame is covered by a foam pad and there is a 360 degree foam covered handle bar to give smaller children the extra support they need as they learn to balance and jump on their own. The Lily Pad Adventure Bouncer is recommended for kids between the ages of three and seven years old and can support bouncers up to 100 pounds. The bounce is provided by stretch bands instead of springs to eliminate pinching. The stretch bands are covered by a pad to add even more protection to your kids while they are bouncing around. The trampoline frame is backed by a one year warranty and the rest of the parts are covered by a 90 day warranty. If you are looking for a small kid’s trampoline with a safety enclosure this is a great option. Fill the enclosure with a ton of plastic balls! To add a little mix to the traditional jumping experience, try throwing 100-200 plastic ball pit balls in the enclosure for a whole new experience. Not all trampolines are designed equally, especially for the younger children or toddlers. All of the products shown above will provide the most safety features available. We highly recommend supervising your children while they are using to trampoline to minimize chance of injury. If you need additional information on trampolines check out our buyers guide, there is tons of great info to point you in the right direction. 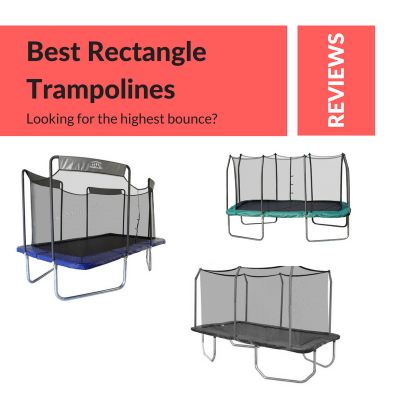 Best Trampoline 2018 – The Top 10 Trampolines We Could Find!